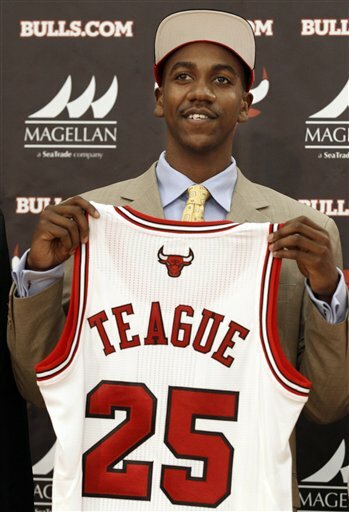 Marquis Teague displays his new Bulls jersey. Dressed in a sharp light-colored suit and blue tie, the Bulls&apos; number one draft picked looked all grown up. At 19 years old, though, Marquis Teague is a young man moving up to another level. Teague, who opted for the NBA after one year and a national championship with Kentucky, has had his family there with him every step of the way. Now Marquis (pronounced like Marcus) will move from his home in Indianapolis to Chicago to play for Coach Tom Thibodeau and the Bulls. This marks the second time that Marquis’ parents, Shawn Sr. and Carol, accompanied a son to an introductory press conference. Just three years ago, Jeff Teague was draft by Atlanta with the 19th pick in the NBA Draft. When the Hawks point guard embarked on his career, his mother had a safety net to help him — and now she plans on doing the same for youngest child. “He will have his oldest brother, Shawn Jr. (he’s 27) with him, like we did with Jeff in Atlanta,” she said. Shawn Sr. played a huge role in his children’s life. He was a collegiate basketball player for Rick Pitino at Boston University and was directly involved in the process of developing his three sons for college. “Early on, I did all the coaching in the back yard, in the gym and did a lot of coaching with them at AAU,” he sasid. He advised his sons not to idolize any specific player but glean the best attributes from different players. Since injured Derrick Rose is not available for quite some time, Marquis will get some playing time. There is no “Rose-like” expectation for Teague since the Bulls are looking to bring in a veteran point guard to handle the bulk of the work load. The Teague family appreciates the proximity of their new NBA destination. Carol says it takes about three hours to get here from Indianapolis — two and a half, if she is doing the driving.